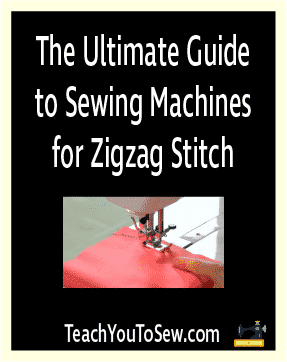 Another commonly used stitch in sewing and especially in domestic settings is the zigzag stitch. This type of stitch allows you to finish off garments without having the threads unravel when you don’t have a serger sewing machine. This type of stitching works well on stretch fabric because it accommodates the stretching and won’t snap like a straight stitch would. The zigzag can also be used decoratively if needed because it comes in different widths and even different patterns. This stitch forms the basis of button holes and is an important feature to have on your basic home sewing machine. Have a look at the three I will be reviewing to get an idea of the features you want to look out for in making your selection. 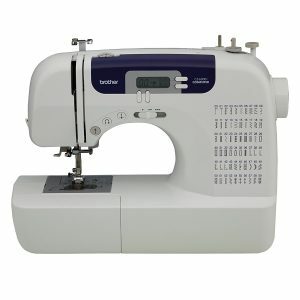 This machine comes with both zigzag and straight stitches and handles fabric from light to medium weight. It comes with a conveniently placed reverse lever for back tacking and a knee lifter for hands free operation. It is not a fully industrial machine, but what is known as a 20U because of the number of stitches per minute it performs at. The straight and zigzag stitch length and width can easily be adjusted via the dial on the front of the machine. The machine comes ready to use as it is pre-oiled and loaded with accessories like needles, bobbins, tools etc. 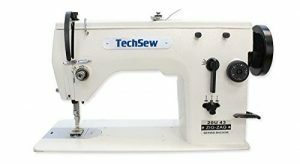 The 20U43 comes with its own sewing table which has a 550W servo speed motor which can be adjusted to run as fast or as slow as you manage. When shipped it comes fully assembled and doesn’t require you to summon a technician for setup. If you have space constraints or really don’t need so much power for your machine, let me recommend one for home use. 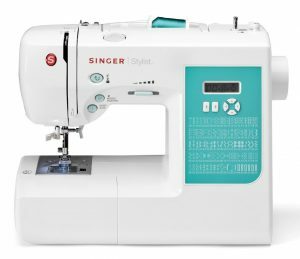 This versatile home use sewing machine comes with a hundred stitches and many of them are different styles of zigzag stitches. 6 of these stitch patterns are easy one step buttonhole stitches. The automatic needle threader allows for convenient threading and that is not the only automated feature. The electronic auto pilot allows you to sew without having to use the foot pedal and go as slow or as fast as the machine allows. This is an excellent all purpose machine for general sewing, quilting and craft projects, facilitated by the 10 included presser feet. The fact that this machine has won the Consumers Digest Award twice tells a lot about the quality of the machine. The categories for which it was designated as Best Buy includes performance, features, quality of build, ease of use, efficiency, styling, warranty, and maintenance/service requirements. Computerized just like the Singer 7258, this model has only 60 stitches but is still capable of performing the same types of jobs as its competitor. Used for sewing, quilting and crafting you can select your stitches at the touch of a button and view your selection on the LCD display screen. You can also operate this machine hands free by just using the on or off button and can also control the speed at which you sew. Along with the standard foot you get 9 other presser feet which give you the freedom to do monogramming and other specific functions. These and other accessories may be stored in the compartment on the arm of the case. While most domestic machines come with a soft cover, this one comes with a durable hard cover to protect your machine from more than just dust. The oversized table is also included as a bonus add on accessory for when you take on those lager projects at home.